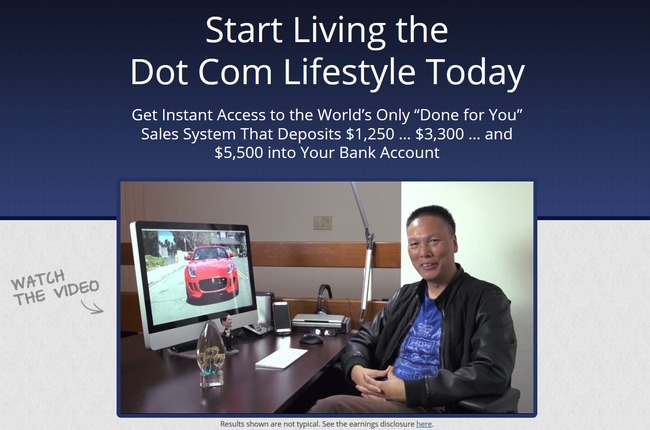 Ultimate Dot Com Lifestyle by John seems like a fool-proof way to make money online, but is it that simple? While we don’t classify Ultimate Dot Com Lifestyle as a scam, we think you deserve to know the truth before committing to it. 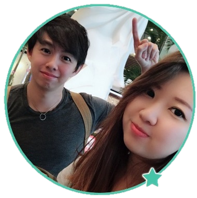 While John did not dig into the details of how it works, we’ll go through the whole process, the real fees involved, and what it takes to make your first commission in this Ultimate Dot Com Lifestyle review. The protagonist of this online opportunity is John, who claims to have made a fortune using an unnamed program. Throughout the sales material, John did not mention the name of the program that he’s using, and he didn’t dig into much details either. We know a lot about him from his sales video – how he started poor, how he built his first successful website during the dot com bubbles, how his income plummeted and how he made it back. In fact, he is still a prominent online marketing guru today. But there is a reason he did not disclose the name of the program – because it’s not for everyone. I was part of this program before I started making money online, so I know how it works. 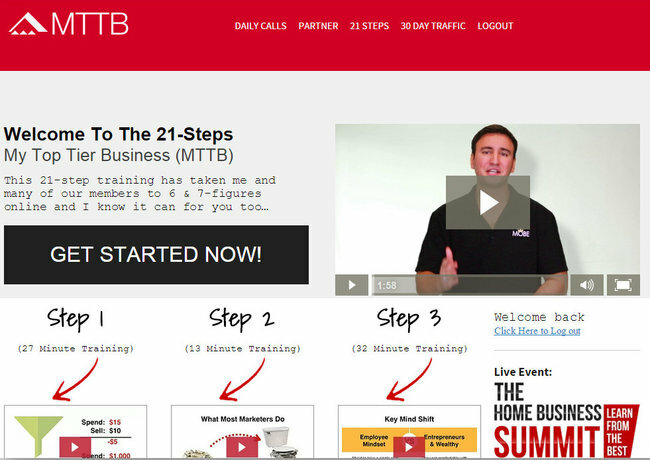 The name of the program is called My Online Business Empire (MOBE), and the 21-step program John talked about is a subsidiary of it called My Top Tier Business (MTTB). It is pretty easy to make money with it if you already have a popular blog or good email list like John. But if you are a complete beginner, be prepared to shell out a lot of money before you even see your first commission. Read the detailed review on MOBE and MTTB if you are interested to know everything about the program. What’s MOBE / MTTB All About? In short, MOBE / MTTB is a multi-level-marketing (MLM) business. Some people like this model, but I know a lot more who thinks it’s a total ripoff. This screenshot was captured when first I joined MTTB back then. Just like what John promised in Ultimate Dot Com Lifestyle, I was told that the program only costed $49 to get started. However, in all the sales material, there was no mention of any of the ridiculous up-sells that were coming my way. Once you pay $49 to join the program, you’ll be brought into the members area, where you need to contact your exclusive coach every 2 to 3 steps for the subsequent videos to be unlocked. Each video tutorial teaches you one way or another that you can use to promote the same program online. One such method is to package the program into different names. For example, John went with the name of Ultimate Dot Com Lifestyle. Some other members went with names such as Online Empire Maker, My Millionaire Mentor and 45 Minute Paydays which we have reviewed earlier. All of these packages invariably link you back to MOBE / MTTB, and anyone who signs up through their page becomes their downlines. They are entitled to a small percentage of commissions that their downlines make. This is the epitome of the pyramid MLM structure, where the uplines make money while the downlines lose money. Is $49 All I Need to Pay? John claims that a small investment of $49 will get you instant access to everything, but we beg to differ. It’s just an entrance fee to the program, and you will be required to pay much more to start earning. Let’s look at some other fees that you need to pay to stay in the program. John did not disclose this recurring fees, but any MOBE member who wants to retain their position in the program needs to pay $19.95 to keep their account active. This is so that even if you do not sell anything for them, they can still make money off you in the form of membership fees. It wasn’t until step 5 of the 21-steps program that I realized I needed to purchase a MOBE license rights for $2,497 to continue the lessons, which I valiantly protested. My coach tried to justify the purchase by saying that I can gain access to many other high-ticket products and resell the license rights as many time as I want, earning big commissions in the process. To put it simply, I’m required to lure other honest people looking to start a business online, in order to earn the handsome commissions. Even if I am to disclose the compulsory up-sells beforehand, I wouldn’t recommend it to any potential customer because this is simply ridiculous. The catch is, you can only earn 50% commission if your downlines (remember that MOBE/MTTB works on MLM model) purchase the same level / lower level of membership. Let’s say I’m a MOBE licensee, which means I paid $2,497 for my license. If my downline buys a MOBE license, I earn $1,000 commission from his purchase. However, if my downline buys the Titanium license afterwards, while I’m only holding a MOBE license, I don’t get a cent of commission! The $3,000 commission from Titanium license purchase will be passed to my up-line. So, to make it simpler, if you want to capture all the commissions from your downlines, you better buy all the way up to Platinum license. And it will cost you in excess of $29,000 (at least) in the process! The Diamond license will be unlocked when you make certain number of sales of Platinum license, but it will cost you another $29,997 before you can start making commissions from it. 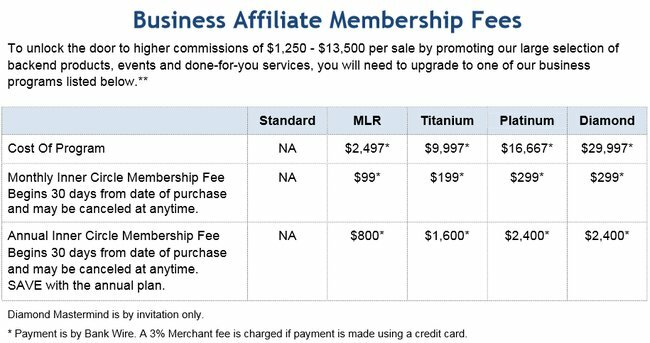 Also, notice the different tiers of membership fees in the table above. As you upgrade your membership license, the monthly recurring fees increases so you are pressured to make sales quickly. Should I Buy Ultimate Dot Com Lifestyle? If you are the owner of a prominent blog or owner of a big email list with a lot of potential buyers, you may make it work. But if you are just a beginner looking to make money online, you better give it a pass. You would’ve lost thousands of dollars before you even start earning. Thank you Edward for uncovering this program a put in under full spotlight. I too nearly blinded by its simplicity and promise. Thank you. Hi Nicole, I’m glad you found the review helpful!